Occupy May Seem To Be Receding, But Look Closer If you ask strangers on the street about the Occupy movement, they might say, "It's over." Yet, Occupiers say they are preparing the ground and that, come spring, numbers and visibility will increase. Occupy Wall Street protesters shout during a "Shut Down the Corporations" demonstration in New York on Wednesday. For people who watch TV news or read newspapers, the Occupy movement might seem to be in hibernation. Most of the encampments are gone, and diminished numbers take part in protests. But there's a lot of ferment behind the scenes — at least at Occupy Wall Street. Check the Occupy Wall Street website and you'll see at least 15 events every day: meetings by working groups on arts and culture, alternative banking, media, security. And there are actions. This week, it was anti-corporate. "We're kind of going to occupy a Bank of America and turn it into a 'Food Bank of America,'" Occupy protester Luke Richardson says, describing an event on Wednesday. Richardson stood behind a table with donated cans of food. Then, an hour later, 200 demonstrators braved the pouring cold rain and marched to the Bank of America headquarters, where they were stopped by police. The following day, there were Occupy student debt rallies and marches by college students across the nation, including New York, protesting budget cuts and rising tuition. 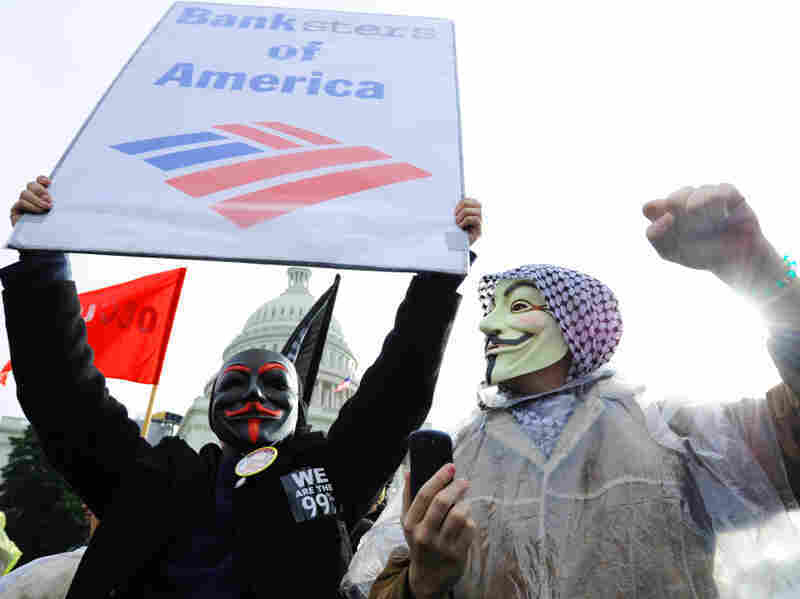 Occupy D.C. protesters chant slogans against Bank of America during a Jan. 17 demonstration in front of the U.S. Capitol. Richardson describes these daily actions as pop-up occupations. "We're going to different areas in the city and kind of just becoming a visible presence, letting people know we are still here and trying to get them interested again," he says. Many Occupy events now happen indoors. If you show up any afternoon at the public indoor space with cafes, tables and chairs, you will see people sitting in circles; they are the movement's working groups. "We have many different spaces throughout New York City that have opened up for meetings and processes and actions and events, but it is not as visible in the same way," says Lisa Fithian, an Occupy organizer and trainer. The General Assemblies — big public meetings — still happen three times a week, although they're far smaller than the ones last fall. At one recent meeting, a participant in the crowd turned and said, "Pretty uninspiring." Then there are the biweekly "spokescouncils," where representatives of each working group try to come to consensus on larger proposals. Serious activists come to these. Instead of votes, representatives can stand aside, meaning they have concerns but will not block a decision. If a group blocks a decision, its concerns are addressed until hopefully consensus is reached. Sometimes this process works well. Sometimes it's messy. An author and organizer named Starhawk has facilitated a number of these councils. "It's not always easy to figure out how people with totally different perceptual styles, understandings of life can work together and make decisions," Starhawk says. But the upside is many people who participate feel they "own" the movement. Mark Bray, who is with the Occupy Wall Street press team, says most people are not aware of all these different activities because the mainstream media just cares about numbers. "What we've been doing over the last months is we've been consolidating our organizing, getting better prepared to deal with what may come and getting involved in these struggles on a local level," Bray says. "And I think that we'll see the benefits of that starting to pay off as we move into the warmer months and more people come out. But I think the criteria by which we've been judged in the mainstream media is by crowds." Organizers point out that this movement is barely six months old. The civil rights and anti-Vietnam war movements took years to take off.